We are South Central PA’s full service hand rug cleaning studio. We do not wash rugs together in a communal bath system or on a conveyor belt machine. Your Oriental rugs are cleaned individually by hand so we are able to reduce the risk of cross contamination, dye bleed, and damage to your area rug. Our hand rug cleaning process allows us to have complete control over your rug at all times to ensure the most thorough cleaning (front, back, and all the way through). 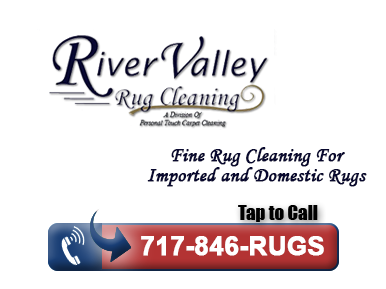 If you want your area rug to be”cleaned” you have lots of options; if you want your rug to be “clean” bring it to River Valley Rug Cleaning. We are proud to be the only area rug cleaner in Susquehanna Valley to be able to offer guaranteed pet odor removal. Every rug that comes into our shop is carefully and thoroughly inspected. We will note any stains, odors, moth damage, color distortion, dye bleeding, fiber damage, and construction issues that may need repaired. With this information, we will choose the best cleaning method for your individual rug. Each color in your rug is tested for stability before the washing process begins. This test may take up to 24 hrs for accurate results and cannot be properly performed in your home. If necessary, we can set the dyes so we can safely wash the rug or use a dry cleaning method. If any areas of concern not previous brought to your attention are revealed through the pre-inspection, we will review the finding with you before we clean your rug. Warning! Most cleaners skip this step! Ask your cleaner how they remove dry soil. If your rug has been affected by flood damage, smoke damage, pet urine, or simply smells like and antique, we will rinse the rug with water and soak in an odor neutralizing bath. We are experiences in every method of rug cleaning and will choose the safest option for your rug.We will choose the best cleaning method for your rug based on the pre-inspection findings. When possible, we prefer to use the old world technique of fully submerging you rug in our WoolSafe approved rug bath solution and gently washing it on both sides. Wetting a rug, as has been done for centuries, releases deep embedded soil to be flushed out of your rug, provides the most thorough cleaning and is the only way to effectively clean odor problems. Your rug will be rinsed free of all soils and solutions until the water runs clear. Excess water will be removed from your rug to prepare it for drying. If your rug has a pile, we will groom the rug and set the pile in the appropriate direction to give it a uniform appearance. Your fringe will be inspected and groomed for drying. Additional cleaning will be performed if necessary. Your rug will be hung in our humidity and air flow controlled drying room, or laid flat on a special drying table. Before your rug is rolled, it is inspected for quality. We will also perform requested work such as specialty stain removal, dye touch up or repairs.